For the Cake:Preheat the oven to 275 degrees F. Grease and flour a 9×13 baking pan and set aside. In a small mixing bowl, mash the bananas well. Add the lemon juice and mix well to incorporate. In a separate medium size bowl, add the flour, baking soda and salt. Mix well and set aside. Using a kitchen mixer, such as A KitchenAid, fitted with a paddle attachment, cream the butter and sugar till light and fluffy, about 2 minutes. Add the eggs to the butter mixture, one at a time, scrapping down the sides as needed. Add the vanilla. Slowly, while alternating, add the flour and buttermilk, mixing well to incorporate.Add the bananas. Pour the cake batter into the prepared pan and bake for 1 hour 10 minutes or till a cake tester comes out clean. For the Cream Cheese Frosting:In a kitchen mixer, such as a KitchanAid, fitted with a paddle attachment, cream the butter and cream cheese on high till smooth and well incorporated.Add the vanilla. With the mixer on low, slowly add the sugar and mix. 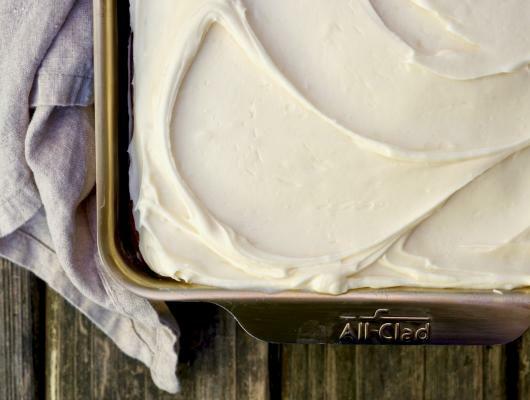 Put the mixer on high to whip the frosting until it is very smooth and free of any lumps. 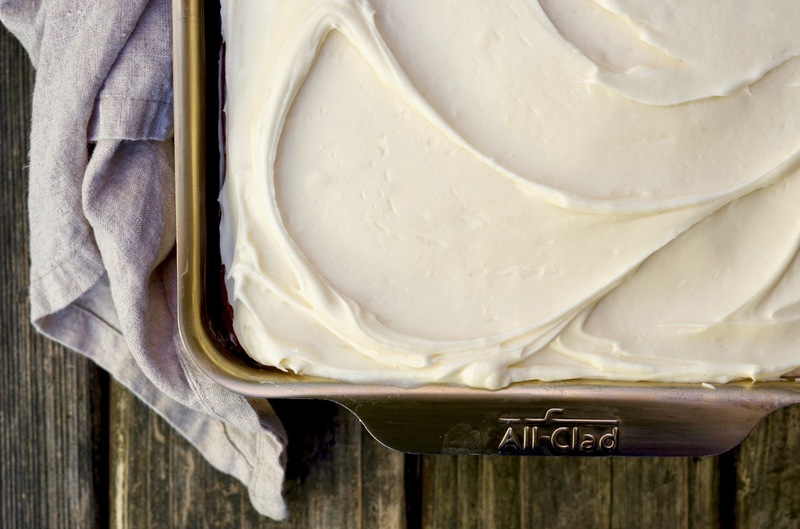 To Assemble the Cake: When the cake has cooled completely, remove it from the baking pan and set on a cutting board. Using a serrated knife, trim the top of the cake as needed to make level as much as possible. Using an off-set spatula, frost the top of cake. Do not frost the sides. Using a slicer knife, run the blade under hot water. Wipe dry and trim the side of the cake removing the harder brown crust exposing the lovely banana cake inside. Clean the knife under hot water and repeat with the remaining sides. Note: store the banana cake in the refrigerator.